People are commonly advised to avoid washing hair every day. On some occasions people may simply not have time to wash hair, but the excess oil is making it look limp and unpleasant. 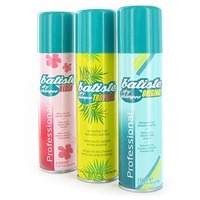 Dry shampoo can simply be dusted into the hair to help manage excess oil without the need to shower. This can increase the speed in finishing the routine and allows maintaining the natural volume of the hair. Besides popular brands of dry shampoos, some homemade dry shampoos also work well. Dry shampoo is a spray or powder that contains ingredients that are designed to absorb excess oil, sebum and dirt in the hair. You do not need to wet it or work it into a lather like a traditional shampoo. This will prevent the hair from smelling dirty and will help you maintain a soothing feel, even if you do not have time to wash. Some formulas will also help you maintain your hair’s natural volume that wetting it can take away. Dry shampoo can simply be brushed into the hair as necessary. Dry shampoos typically contain ingredients such as SD Alcohol 39-C (Alcohol Denat), butane, octenylsuccinate, isobutene, kernel oil, isopropyl myristate Alicia, cyclodextrin, cyclomethicone and artificial fragrances. Despite the wide variety in pricing, many of these ingredients are largely the same amongst brands. There are many brands of dry shampoos on the market. Popular brands include Klorane Gentle Dry Shampoo, Batiste Dry Shampoo, Oscar Blandi Pronto Dry Shampoo, Lush Candy Fluff Powder, TIGI-Rockaholic-Dirty Secret Dry Shampoo, Algemarin Shampoo “Dry-Powder Spray,” Rene Furterer Naturia Dry Shampoo, Finley Hair Powder Brown, Samy Shampoo Dry Spray, Ojon Rub-Out TM Dry Cleansing Powder and others. Those that prefer natural ingredients can easily make a dry shampoo from ingredients in their home. Mixing a variety of ingredients can often provide more effective results than using a single ingredient on its own. Clay is very absorbent, which is particularly helpful if you are trying to rid your hair of dirt and oil. White and green clays are more effective than other varieties. Adding powdered milk to your dry clay can help make your hair shiny after using your dry shampoo. You can also add baby powder, talcum powder or baking soda to help improve the smell of the product. Ground oatmeal is one of the most common ingredients in commercial dry shampoo. Grind two tablespoons of oatmeal for a single use. Add baking soda in equal amounts, thoroughly mixing them to get the maximum efficiency out of your shampoo. Baking soda will help absorb odors in your hair while oatmeal will help absorb dirt and grease on the hair. Mixing an equal amount of ground almonds and white flour can create a very absorbent dry shampoo with a pleasant smell. 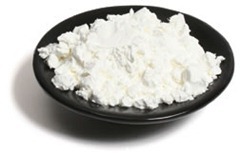 White flour can be replaced with cocoa so that the mixture is not easy to detect in dark hair. Ground almonds can also be matched with cornmeal to make an effective dry shampoo. Mix 2-3 teaspoons of cornmeal to your almonds to create the basic mixture. You can also add 2-3 drops lemon or castor oil to improve the smell and provide a natural moisturizer for your hair. One or two teaspoons of baby powder can also be added, but this should be avoided by those with dark hair as it can cause discoloration. Cornmeal or cornstarch are ideal for absorbing grease, making them an ideal ingredient in dry shampoo for those with very oily hair. Mixing cornmeal with oatmeal can increase the absorbency of your mixture. You can also amplify the effectiveness of your dry shampoo by adding a teaspoon of orris root or equal parts finely ground almonds to your mixture. Reviews performed on grass root levels have revealed that dry shampoo is not as effective at cleaning hair as a traditional shampoo. These are only intended to be used occasionally when you are in a hurry and do not have time to wash properly. They can also be used in between regular washes to help maintain proper oil levels. Dry shampoo is not intended to be a replacement for your regular hair care routine.